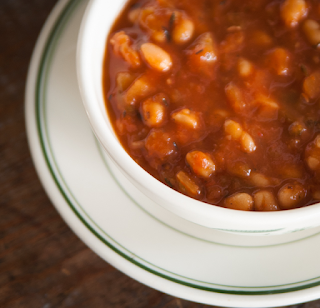 I remember my mother making us a navy bean soup and encouraging us to try it with ketchup--who knew this was a thing in the South? I made this recipe yesterday and realized that it was a gussied-up version of that same thing. Soak 1 lb. navy beans overnight. The next day, drain them and put them in a large pot. Add water to cover by at least an inch. Bring to a boil, then simmer for 3 1/2 hours or until beans are tender, or use a pressure cooker and cook for about half an hour. You want the beans tender but not falling apart. You can take out the turkey wings and shred the meat into the soup, or don't bother--just work around. I served this with some pitas split and drizzled with olive oil and toasted, because I needed to use them up. And a salad with a mild creamy cheese on the side. Recipe, with some modifications, comes from Marion Cunningham's The Supper Book . For the Aussies: we call navy beans haricot beans.